Philip and Collette first felt God’s call into ministry during Bible school. Raised as missionary kids in Spanish-speaking countries, they saw firsthand the need before them and felt that Mexico was their field of ministry. They married in July 1981 and promptly made the move back to the mountain villages of the northern country where over the next twenty-one years they raised their three daughters, were involved in church planting and training, and worked alongside many dedicated national pastors and fellow missionaries doing outreach into new areas of the country. In 2001 the Burches moved to Salamanca, Guanajuato, with a vision to plant a church in the heart of Mexico. In 2003 along with coworkers John and Jan Dykes, they joined HIM and have been amazed at God’s leadership in making that decisive step. The value of a strong organizational base gave them the encouragement and backing they and the Dykes needed over the following six years as they ministered in the diverse urban setting—so different from the rural ministry which they had previously experienced. In 2009 Philip and Collette returned to the States as their aging parents needed care and long-term support. Leaving Salamanca and the church there in the hands of national pastors was a new experience for them as they never anticipated leaving the field. However, looking back, God’s leadership was definite. Relocating into inner-city Harrisburg, Pennsylvania, and experiencing the diversity and multiple cultures of this State-side setting, the Burches began seeing firsthand the challenges of ministering to the Hispanic community who feverishly are pursuing the dream of a better life. Working bi-vocationally while caring for their family members, Philip and Collette were able to volunteer, have home Bible studies, and share Jesus with their friends and neighbors. In 2014 they were asked to take the pastorate of the Iglesia Evangelica de Santidad in Lebanon, Pennsylvania, where they currently minister. The Burch’s passion and calling is to see the Hispanic community of believers come into the deepening grace of entire sanctification and to see strong Christian values taught to their families. They feel privileged to be involved with the growing number of HIM churches here in the US and would encourage all to pray for this mission field on our own soil. The Burches are the proud parents of three daughters and three fine sons-in-law and grandparents of nine grandchildren. 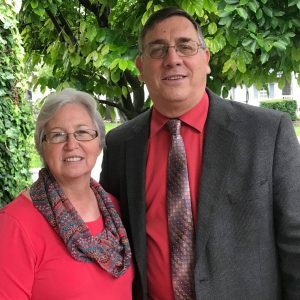 All residing in Pennsylvania, Shari is married to Jeff Stratton, who pastors in Chambersburg; Brenda married Brent Lenhart, who currently pastors in Mifflinburg; and Alicia and her husband, Dwight Habecker of Myerstown, are involved in their home church. Nine grandchildren, ranging from babies to teenagers, bring continual blessing to Philip and Collette, and their greatest desire for their grandchildren is to see each one learn to know Christ.